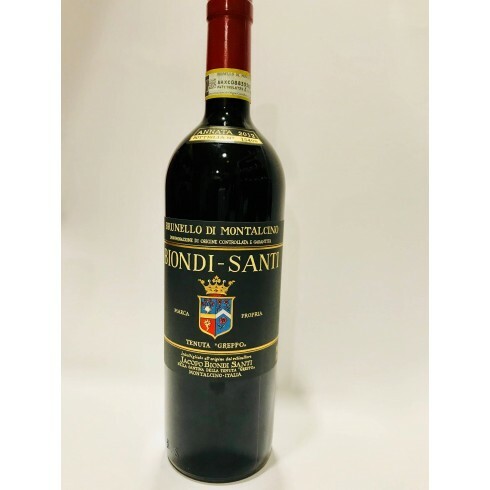 Biondi-Santi Brunello di Montalcino DOCG - Available| Saporidoc UK. Maturation 3 years in Slavonian oak casks , minimum four months refining in the bottle. Pairs with It goes beautifully with refined meat dushes. Excellent as a meditation wine. Serving temperature 16-18 C.
The vines for the Brunello di Montalcino Biondi-Santi have an age of 10 to 25 years and grow in the Tenuta Greppo vineyards outside Montalcino in Toscana at altitudes between 300 and 500 m.
The grapes were manually harvested, carefully sorted, and destemmed. The grapes were fermented in stainless-steel tanks, followed by malolactic fermentation. The wine was aged 3 years in Slavonian oak casks followed by at least four months in the bottles. Bouquet: Complex with note of withered rose. Taste: Harmonic, good structure, warm, with tannins and acidity in perfect balance, persistent, and savoury.